This antibody detects Drebrin A and E in samples from human, mouse, rat, guinea pig, and cat origins and Drebrin E only in chicken samples. Mouse Brain Tissue Extract (ab7934). For maximum product recovery, after thawing, centrifuge the product vial before removing cap. Our Abpromise guarantee covers the use of ab12350 in the following tested applications. WB Use a concentration of 10 µg/ml. Detects a band of approximately 110 kDa (predicted molecular weight: 65 kDa). The difference in the size of the detected band (~110 kDa) and in the predicted (~65 kDa) is due to the large number of negatively charged residues in this protein. Block membrane with 5-10% milk for 1 hour. ICC Use at an assay dependent concentration. Fix cells with 4% PFA for 15 minutes. Permeabilise cells for 15 minutes with 0.1% triton X100 in PBS (see Ikeda K et al). ICC/IF Use at an assay dependent concentration. See Toda et al. IHC-FoFr 1/1000. See Keon et al. Drebrins might play some role in cell migration, extension of neuronal processes and plasticity of dendrites, respectively. Brain neurons. Also found in the heart, placenta, skeletal muscle, kidney and pancreas. Western blot showing detection of drebrin in mouse and rat cortical lysates by ab12350. 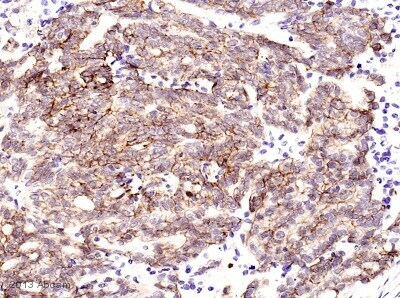 IHC-P image of Drebrin staining on Human ovarian carcinoma sections using ab12350 (1:100). The sections were deparaffinized and subjected to heat mediated antigen retrieval using citric acid. The sections were blocked using 1% BSA for 10 mins at 21°C. ab12350 was diluted 1:100 in TBS buffer (containing BSA and Azide) and sections were then incubated with ab12350 for 16 hours at 21°C. The secondary antibody used was Biotin conjugated Goat polyclonal to Rabbit IgG (1:250). 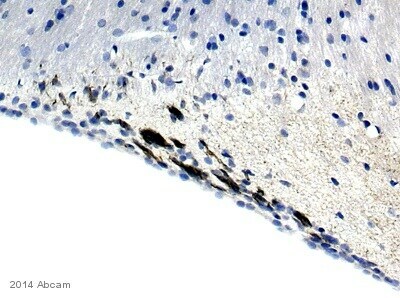 ab12350 at 1/50 staining mouse brain tissue sections by IHC-P. The tissue fixed in 4% Formalin, diluted in Dulbecco A PBS with standard pwax processing. Citric acid 0.01M pH6 was used as antigen retrieval solution. The tissue sections were incubated with the antibody for 2 hours. A biotinylated goat polyclonal antibody was used as the secondary. The image shows the lateral ventricle showing high cytoplasmic positivity in migrating progenitor neurones in the subventricular space.There is a low level of positivity in the dendritic field of the striatum; this appears to be specific. An identical pattern of staining is seen in same area of rat brain. All non-migratory cells in the same field are negative. The Corpus Callosum is negative. Immunohistochemistical detection (on formaldehyde/PFA-fixed paraffin-embedded sections) of Drebrin antibody [M2F6] (ab12350) on Quail Tissue sections (embryo d5/6 brain). Antigen retrieval step: Heat mediated. Blocking step: 1% BSA for 10 mins at RT. Primary Antibody: ab12350 incubated at 1/200 for 2 hours at RT. Secondary Antibody: Biotin labelled goat anti mouse Igs (1/200). Immunofluorescent staining in the rat brain cerebellum with ab12350 mouse monoclonal Drebrin antibody. Drebrin-positive neurons and fibers are observed. Picture taken with X20 objective. Protocol: IHC free-floating protocol using 4% PFA fixed brain tissue. Rats were intracardially perfused with 4% PFA. Tissue was post-fixed overnight in the same fixative, cryoprotected in 20% sucrose and frozen in OCT. Primary antibody ab12350 was used at 1/1000 incubated overnight at room temperature. 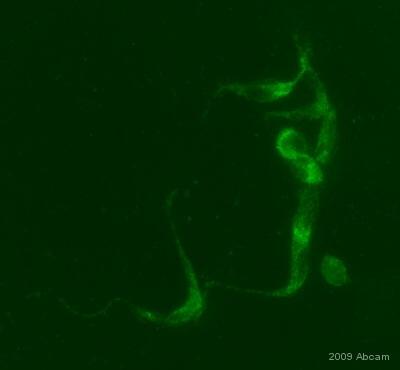 Secondary antibody was Alexa Fluor 488 used at 1/1000, 2h incubation at room temperature. Image recoloured in Adobe photoshop. Overlay histogram showing SH-SY5Y cells stained with ab12350 (red line). The cells were fixed with 4% paraformaldehyde (10 min) and then permeabilized with 0.1% PBS-Tween for 20 min. The cells were then incubated in 1x PBS / 10% normal goat serum / 0.3M glycine to block non-specific protein-protein interactions followed by the antibody (ab12350, 1µg/1x106 cells) for 30 min at 22ºC. The secondary antibody used was DyLight® 488 goat anti-mouse IgG (H+L) (ab96879) at 1/500 dilution for 30 min at 22ºC. Isotype control antibody (black line) was mouse IgG1 [ICIGG1] (ab91353, 2µg/1x106 cells) used under the same conditions. Acquisition of >5,000 events was performed. This antibody gave a positive signal in SH-SY5Y cells fixed with 80% methanol (5 min)/permeabilized in 0.1% PBS-Tween used under the same conditions. Western blot analysis of Drebrin expression in mouse brain (1) NIH/3T3 (2), Jurkat (3), HeLa (4), and PC12 (5) using Drebrin mAb (ab12350). Publishing research using ab12350? Please let us know so that we can cite the reference in this datasheet. Thank you for your reply and for providing that information. I have organized for a replacement vial of ab12350 to be send to you. As you purchased the antibody from Cedarlane, we need to send to them first and they will then ship it out to you. Hopefully you should have it by the end of the week. I do appreciate your patience in this matter and if there is anything else I can help you with, please let me know. As I mentioned before, I prefer a different lot. If not possible, send the same lot. I am sorry about all the emails, however I do need to make sure that I am sending a replacement to the correct place and since you ordered through Cedarlane, I cannot just look at the shipping address. The PO and order number you provided did not match anything in our system (I suspect these are Cedarlanes order information not Abcams), but I tracked what I believe to be your order through the lot number. However before send a replacement antibody, I do need you to confirm either the order date, maybe call Celarlane again and ask them to provide the PO# they used with Abcam. As soon as I can verify that I have the correct order, I will send the replacement. Once again, I do apologize for the delay in you receiving the replacement, but I do need to make sure that I have your order and not someone else’s. I think I have found your original order and so will be able to get you the replacement next week. Before going further, could you confirm the date that the original order was placed and also confirm that you are ok with receiving a new vial of the same lot. As I mentioned in my previous email, we do not have a different lot that I can send. If you would prefer a different antibody, that would also be possible. I look forward to your reply and helping to resolve this situation. Unfortunatelly I do not have a PO #,. It was ordered through the Cedarlane biobar. I would be happy to send you a different lot of the antibody. Before I can do that though, I do need to have the original order information. Since you ordered via Cedarlane, would you please contact them and ask them to provide you with the order information they sent to Abcam. Once I have that information, I can go ahead and send the replacement. I look forward to your reply and resolving this situation. secondary antibody-biotin conjugated using the ABC kit from vector labs as well as ABC reagents used as recommended by Vectors manuals. Based on the information that you have provided, I believe the best way forward is to either replace or refund the antibody for you. Unfortunately we do not have another lot of ab12350 that I can send. Please let me know how you would you like to continue and if you could also provide either the Abcam order number or the PO# used to purchase the antibody, that would be very helpful. We have been trying to optimize the Debrin antibody, ca# ab12350 on human paraffin samples including human adult brain and Glioblastoma Multiforme (GBM) specimens. We followed your IHC protocol as recommended, but we noticed that in a new batch of the antibody lot#***, the localization is nuclear instead of cytoplasmic signal. However, the antibody is still picked by few neurons as cytoplasmic, but high number of non specif binding is nuclear in human brain cells as well as GBMs. From our knowledge this not reported in literature. We have used previous lots of this antibody and worked well. Below is IHC on normal human adult brain. Neurons is showing Drebrin as cytoplasmic, however, non specific binding to other cells type as nuclear signal. I am sorry about the issues that you are having with the current lot of ab12350 in IHC-P. The antibody is covered under our Abpromise for six months and is guaranteed to work in IHC-P on human samples. For our records would you able to let us know all the different conditions (primary antibody concentration, blocking, incubation times etc) that you have tried using the current lot of the antibody? I know you successfully used previous lots before, but there may be some protocol advice I could give. If we cannot resolve the issue you are having with the antibody then I would be happy to either send a replacement antibody. To replace the antibody could also provide either the Abcam order number or the PO# used to purchase the antibody?